For the second year running, Julia Bradbury and the TOG team spent a wonderful day planting trees at Langley Vale Wood in Surrey with the Woodland Trust and Premier Paper Group. It was a fantastic day out for a fantastic cause, with around 3000 native saplings – including oak, beech, cheery and hornbeam – planted by a huge team of enthusiastic volunteers. 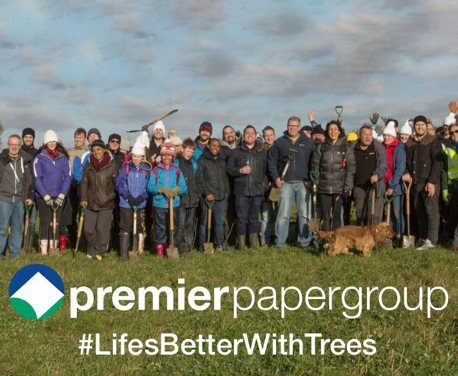 It was all part of the Carbon Capture Scheme, which has been set up by Premier Paper Group and the Woodland Trust to help businesses become greener. Around 90,000 trees have now been planted at the Woodland Trust’s Langley Vale site, with another 70,000 still to come! Every penny that comes through the Carbon Capture Scheme goes straight to supporting the amazing work of the Woodland Trust – and so far they’ve raised almost £1 million – so it really is a great initiative to get involved with. Planting trees is a fun activity to do with family and friends, and plays a vital role in absorbing and capturing CO2 emissions to protect our environment. Trees are the lungs of our planet and provide so many vital habitats to so many vital species, and the Woodland Trust aims to plant 64 million of them over the next 10 years. If we all team up to do our bit on fun and rewarding days like this, all of our small steps will join together to make a big difference for the environment.